After we visited Lucas at college for his award ceremony, I fulfilled a life-long dream to visit C.F. Martin, and Co., purveyors of fine guitars for since 1833 in Nazareth, PA. I’ve only been on the east coast since 1981, but I’ve owned a Martin D-35 since I bought one in 1977(?) in Flagstaff, AZ. I had been going to the local music store for months, playing it in the store, until I finally came up with the money – $750 at the time was a lot for a poor college student. I’m still not sure how I came up with the funds, but it was through legitimate means, I assure you. For about 25 years, this was my only acoustic guitar – my thought was, “I have the best guitar, why would I need anything else?” Well, 5 more guitars later….my new favorite is a 2000 Martin D-18GE I found on craigslist for $1800. The intonation on this one is a bit wonky but I recently replaced the bridge saddle and that made it better, but not perfect. Other than that, it’s wicked loud! 🙂 I’ve been using it on the recent fiddle tune jag J and I have been on. Nazareth, PA is a small town about 20 miles south of I-80, so not too much out of our way to the big city – NYC. I had the Google navigation going on my droid, so made it to the Martin Guitar Factory without a problem. It’s located right in the middle of a residential section of the town; I was not expecting this guitar mecca to be so unassuming, although they did have a nice big visitor’s parking lot right across the street. The building looks pretty new and clean. They even made a replica of the old guitar factory (located on North St.) on the outside of this one. Otherwise, you might actually miss it. There is a nice visitor center so at some point, they decided to embrace all the pilgrims rather than turn them away. Good strategy, as there are many loyal Martin people out there and the competition these days is stiff. There is an awesome museum with mostly old guitars, but also a history of the company. The tour is one hour long and the first one starts at 11 am. We got there about 10:45 and got the last 3 slots out of 15 in the group. You get headsets that transmit the tour guide’s voice to you so you don’t miss anything. Good idea because some parts of the factory have machines going and people kind of spread out as you’re walking through (like me – I was always playing catch-up there was so much to look at and take pics of). This is what you see when you first start the tour – a giant guitar replica that you can even walk into. Includes lots of detail, like the bracing etc. Pretty cool. The custom shop is the first thing you see on the right. This guy was polishing up this nice little number and proudly showed off his work. This photo gives you an idea of the size of the place. Lots of good wood everywhere. I’m not sure how they keep track of it all! Clothes pins are an ancient luthier trick of the trade. This looks to be binding-land. Necks looking for a body. This is in the finishing part of the factory. Bodies looking for a neck? Everywhere you turned there were stacks of guitars, or at least parts of them! Machines do a lot of the polishing, but the final inspections are done by real people. There’s a repair shop, too. This 1967 guitar was getting a new top. Look at the fru fru on that guitar. This is the millionth guitar, now in the museum. I suppose someone must go in there late at night and give it a strum. After the extensive tour, I made everyone go over to the old factory to have a look. Right now it’s a couple of rooms that store guitar parts and you can go in there to pick out parts to build your own. You can grab all the pieces right off the shelf. I thought that the woman there said these were ‘seconds’ from the factory, or rejects. I didn’t look closely enough but probably nothing a little sandpaper couldn’t take care of. All in all, if you are even close to Nazareth, PA (about 1.5 hrs from NYC) go the Martin Guitar Factory for a couple of hours. Luckily there wasn’t a retail guitar store there, or it could be dangerous. There is a store and a “pickin’ parlor” but some kid was in there playing Justin Beiber or something, so I didn’t go in. Then it was on to New York to drop Zach off at the train station back to Boston. One day a mysterious letter arrived from Lycoming College, where Lucas goes to school, informing us of an award that would be bestowed upon himself at the annual honors convocation. And would we like to attend? Why, yes, we would! Thus began the trip to Williamsport during the MA spring vacation. Zach decided to hop on the bus too. After a lovely 7 hour drive across MA, CT, NY, and PA, with one stop at Alexis Diner in Newburgh, NY, we arrived on the scene. Went to dinner at the Bullfrog Brewery, the most happening place in Williamsport besides the mall. Zach stayed with Lucas in the dorm and reportedly there were about 500 jello shots also in attendance that night. We were at the Holiday Inn Express, which is supposed to be nicer than the regular Holiday Inn attached to it – not sure how that works, but there was a bed, a TV, and a bathroom, so it worked out. The Lycoming Honors Convocation hands out a bunch of awards at the end of the year for academic achievement. It was held in the gym, which kind of gave it a high school feel. Lucas is in the band, and the band played some warm-up numbers as well as the closing piece. Lucas plays first chair in the band and they sound pretty good. (He also got to attend the PA Intercollegiate band festival again this year.) So, I guess it wasn’t a huge surprise that he got an award for music. 🙂 Officially, it was the Richard Mix Prize in honor of Dr. Will George Butler. In fact, Mr. Mix was there and congratulated LR after the ceremony. He also got some cash out of it. This week, Lucas goes on band tour somewhere unbeknownst to me, then he’s back in Brookline before going off to Israel for a dig. That’s it for now! Way to go, Lucas!!! 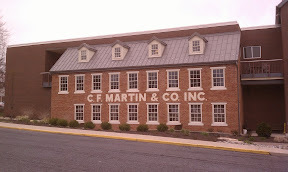 Next post coming up on the next phase of the trip – to the Martin Guitar Factory! Anyhoooo…on with the show. I arrived at 6:40, having secured my usual secret free-parking space near Harvard Square. Club Passim, or as most people call it, Passims, is a basement venue in Harvard Square. Mostly they have folkie acts, so having a jazzer appear was a bit unusual. It’s a great place to hear music because 1) it is quite, um, ‘intimate’, meaning that you are practically sitting not only on the person next to you, but also on top of the performers; adn 2) the sound is really good – not too loud and a mix where you can actually hear everything. Add to that, the aforementioned intimacy, where you can hear the acoustic nature of the instruments blending with the sound system, and it makes for a good room. 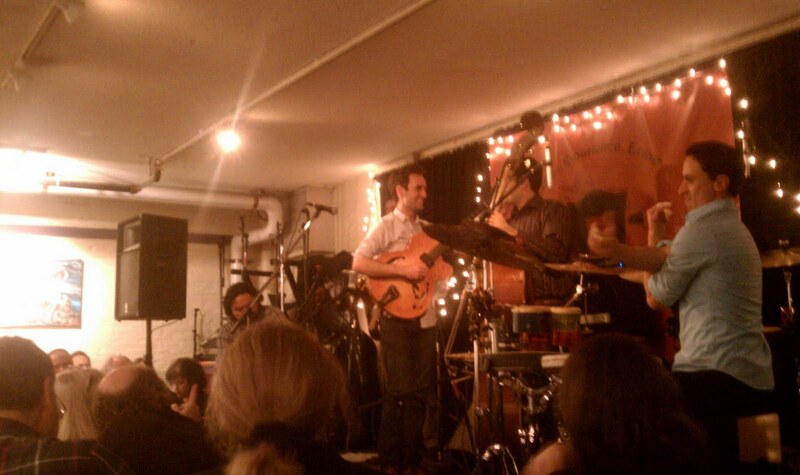 The Julian Lage Group this time is a quintet, adding a cello and tenor sax to the usual guitar, bass, drums trio that I saw at the Beantown Jazz Festival in Sept. You can see how crammed they are on the tiny stage. 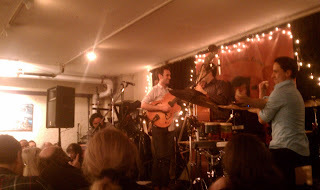 This was the CD Release party for Gladwell, available on April 26, although they had them at the show. They played a lot from that album, as far as I could tell. 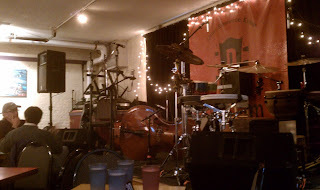 The show was excellent and ran from about 7:10, aka “jazztime” to 9 pm. I’m pretty sure the opening number was “Listening Walk” from Gladwell, due out on April 26. Talk about a workout on the left hand! No wonder at the end of the night Julian said that he’s been having to take care of his left hand due to overuse (I can relate, but he’s only in his 20s!). 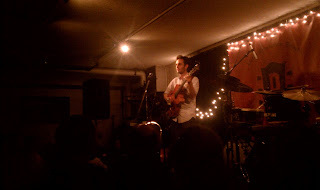 For the most part the cello and sax were a calming counterpoint to the frenetic picking and percussion of that tune; they seemed to play that background role quite a bit throughout the concert – more like texture backing the trio rather than being on equal footing as soloists on every song. They did get some extended solo turns later in the set. I liked the way it worked. The band was tight, able to shift on a moment’s notice from loud to soft, from quiet introspection to frenetic jam – this is the stuff that makes for a great night of music making. Other tunes they played from Gladwell included However, Cocoon, Telegram, and probably more, but I’m just judging by the clips on amazon.com and what I remember. 🙂 I can hear in his playing a ton of influences as well as his own unique voice. Sometimes, I hear the Pat Metheny lick or harmony, but he doesn’t stay there long. Like Metheny, it sounds modern and rooted in tradition at the same time – whether that tradition is jazz, rock, folk, country, or something else…I think it’s all of those. Just watch some of the videos on his site or youtube and you can also see that he is really having a good time. Having complete command of your instrument doesn’t hurt, either. That video of Lil Darlin’ kinda sums up the group aesthetic. The tune is a jumping off point for an extended improvisation. The interplay among the musicians is awesome, as they almost go into a free jazz section for an extended period before bringing it back home. You can do that if you 1)know the tune inside out; 2) have chops for days; and 3) listen closely to what is going on in the moment. You can also see in that last video the unusual technique of the percussionist, Tupac Mantilla – using mostly his hands to play. Last night when they played Lil Darlin, he stood up and mostly played by clapping, snapping fingers, hitting himself in various places (knees, face, chest, etc) and even reached over the drum set to bang on the bass for a bit (and on the bass player too, for that matter). The encore number was, in his words, “well, you’ll know what it is” – i.e. Freight Train. The first part was the way I learned it, but not after that!! His right-hand technique is something to behold on this one, as he played with a pick and was all over the strings with ease. A great ending to a spectacular night of music. P.S. That guitar he plays is a Linda Manzer “Blue Note” that he’s had since he was 11 yrs. old. There was an article in the Fretboard Journal about him I read again last night. It can sound really acoustic or really electric depending on how he plays it. He does set up with both a Fender Twin amp (I believe) and a mic in front to get the acoustic sound.